Today is a rare cold day in Los Angeles. Like many Angelenos, I firmly believe that any temperature below 68 degrees is an excuse to call into work sick, wear sweatpants, and snuggle under the covers for the better part of the day. It is also a great opportunity to make chili for dinner. 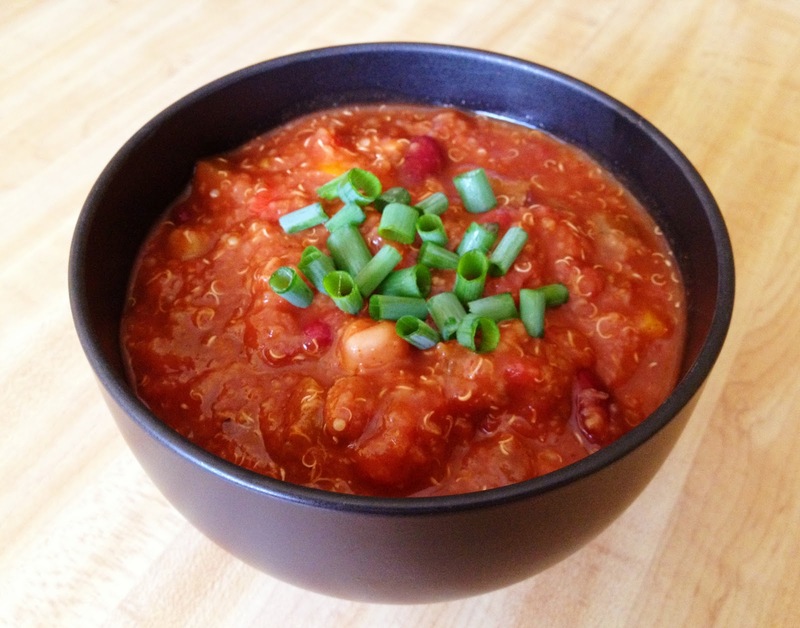 This vegetarian quinoa chili is one of the best chili recipes I have ever had. It is hearty and filling, with a punch of flavor that is in no way sacrificed by the fact that is meatless. Chili lovers might be horrified at the thought of meatless chili, but I swear, this one is worth trying. The quinoa provides some texture, and is a great source of fiber, protein and iron. Beans, vegetables and classic chili spices blend together to make a wonderful one-pot meal. I doubled the recipe, and it lasted nearly a week. It got rave reviews from all who tried it, vegetarians and meat lovers alike. Enjoy! In a medium saucepan, combine the quinoa and water. Cook over medium heat until water is absorbed, about 15 minutes. Set aside. In a large pot, heat the olive oil over high heat. Add the onion and cook until tender, about 5 minutes. Stir in garlic, jalapeño, carrot, celery, peppers, and zucchini. Cook until vegetables are tender, about 10 minutes. Add the black beans, kidney beans, garbanzo beans, tomatoes, and tomato sauce. Stir in the cooked quinoa. Season with chili powder, cumin, salt, and black pepper. Simmer chili on low for about 30 minutes. Serve hot. Garnish the chili with green onions, avocado slices, cheese, sour cream/Greek yogurt, chips, crackers, if desired. This chili freezes well.